The bathroom is one of the most important rooms in your house that you use every day. Its function to clean and freshen your body might serve the opposite; if black mold starts to grow and develop in your bathroom. 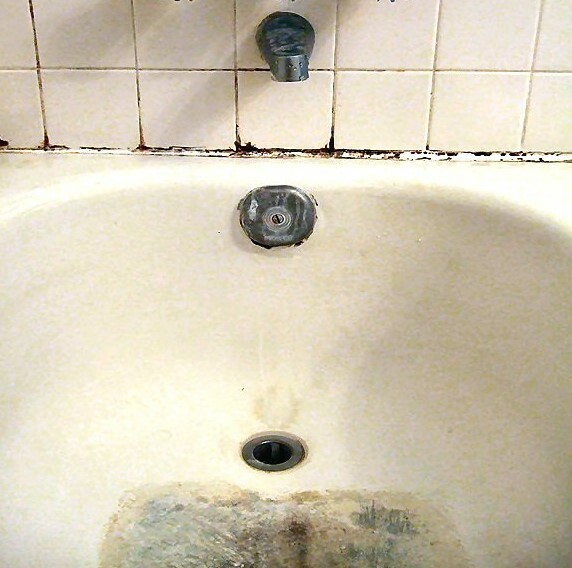 Black mold can infect any fixtures and fittings of a bathroom. 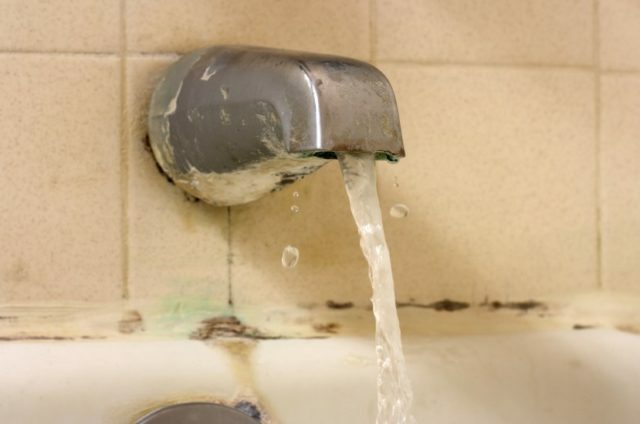 Because this type of mold likes to grow in a dampened area, bathroom fixtures that have direct contact with water such as the floor, bathtub, and shower, have a greater risk of black mold infestation. What does Black Mold Look Like in Bathroom? 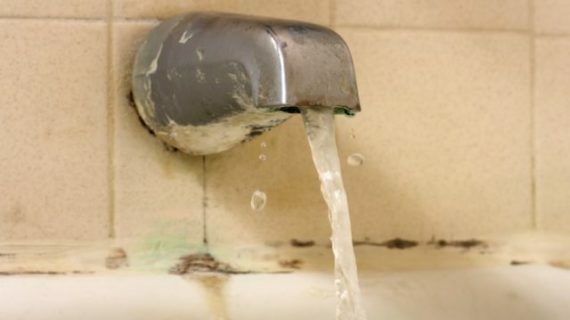 The main reason black mold infests your bathroom is due to the humidity and plentiful supply of water. 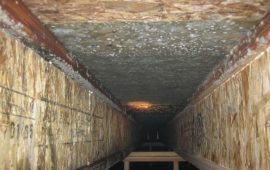 Such condition provides the perfect ground for mold development. Water coming out from basin, bathtub, and shower will create wet surfaces that are claimed by black mold as the place for it to live in. In addition to water supply, another cause of black mold infestation in the bathroom is related to the steam evaporation. If you like using warm or hot water in the shower, the chance of black mold growing in your bathroom increases. The bathroom does not have well ventilation system compared to other rooms in the house. It also becomes the cause that can increase humidity from the steam and water circulation inside the bathroom. Broadly known as toxic mold, black mold that has infected your bathroom can put you and your family in danger. 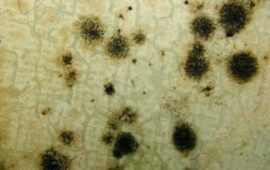 Black mold actively produces mycotoxins, the poisonous substance of fungus. Mycotoxins can cause many health problems, including infections and allergic symptoms. The following symptoms are caused by mycotoxins from black mold infestation. Respiratory infections, including coughing, sneezing, and sore throat. In some serious cases, the toxin can lead to pneumonia, breathing problems, and asthma attacks. Chronic fatigue, exhaustion, headache and migraines, even mental depression and mental impairment. Blood diseases, including hemorrhage, nosebleed, and mucous membrane irritation. Damage to internal organs and the suppression of immune system. Sinus congestion such as difficulty breathing, runny nose, ear infection, sneezing, coughing, and sore throat. Allergic reactions, including red, itchy, and watery eyes, as well as hives and rashes on the skin. More bad news is, black mold does not only put people at risk but also can be the cause of pet’s sickness. 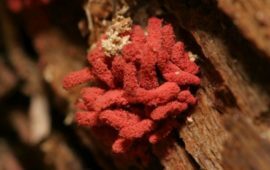 Some health problems and serious infections caused by black mold are dangers for your pet’s life. 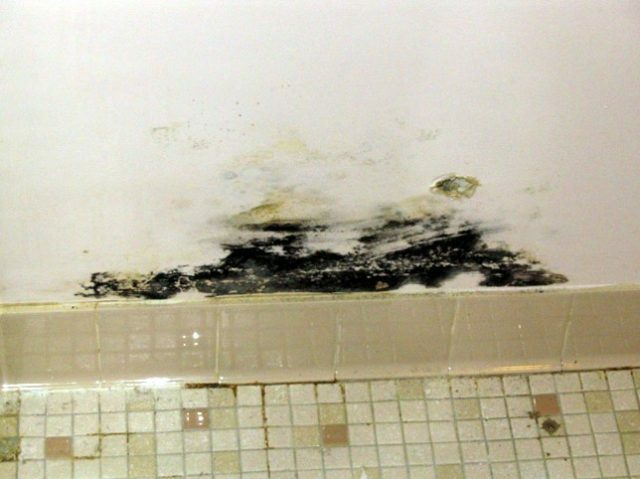 Black mold in the bathroom has the muddy and spongy appearance and can be found on the bathroom floors, walls, ceilings, or shower stalls. Colonies of ants can also detect the presence of black mold. If you find the colony of small ants gathering in one spot of your bathroom, check the spot in case black mold has infected it. If the infestation of black mold on the bathroom wall is no larger than 10 square feet, you can easily remove it by doing some simple steps below. Dissolve some detergent in hot water. After you get the solution, use it to wash the bathroom wall which has been infected by black mold. Wash it thoroughly until the mold layer is covered. Wipe the wall with a clean rag. Make sure that the wall is completely dry before you move on to the next step. Apply the fungicide as the next substance. 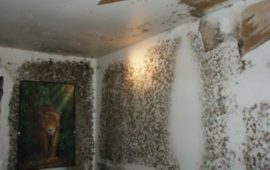 Fungicide is useful to kill fungus and molds on the wall, and can prevent them to grow in the same place. Just like the solution of detergent and hot water, you also need to apply the fungicide thoroughly on the bathroom wall. Wait for about 10-15 minutes after fungicide has completely covered the wall. 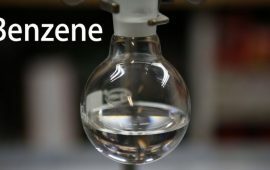 That chemical substance will remove the mold from the surface to the construction of the wall. Rinse the bathroom wall one more time and let it dry. Please note that the above steps will only work for the small area of the infected wall that is less than 10 square feet. 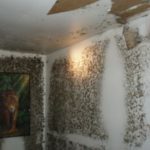 If black mold infects bathroom wall in a larger area, it is better for you to call professional inspectors to remove the mold and help you get rid of this dangerous organism. They will use negative air pressure to destroy the mold. 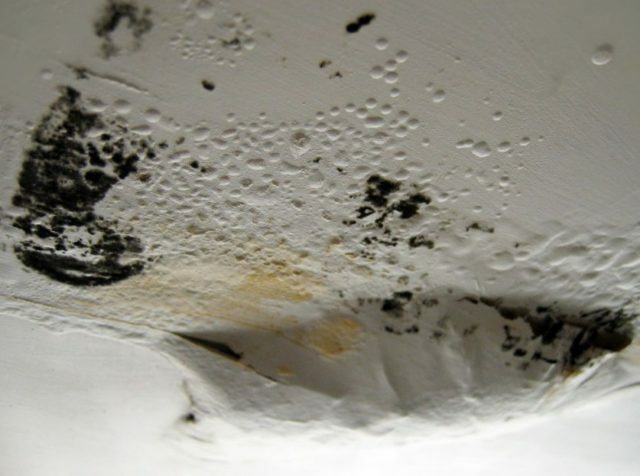 Black mold can also be found on the bathroom ceiling, especially if the ceiling has been leaking for a long time. 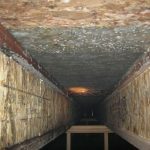 Removal ways of black mold on the ceiling are quite similar to those that you can do for the bathroom wall. You can use the solution of detergent or a special chemical substance like fungicide. When you need to remove black mold on the bathroom ceiling, it is important to find the safe place to reach the mold location. Remove the ceiling paint using paint scrapper before you clean the ceiling with a chemical substance. Don’t forget to wear protective equipment such as a mask, safety goggles, and rubber gloves. 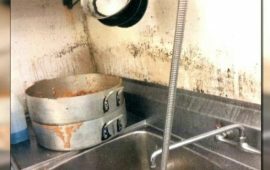 Black mold can also be found in bathroom sink drain. If you notice small patches in black, dark green or gray colors in the sink drain or drain pipe, mold removal steps should be done immediately. To remove black mold in the drain, you can scrub it using a brush or a piece of cloth. Rub all parts in the structure thoroughly, including the grate that is possible to be infected by black mold as well. If you have difficulty in reaching small parts of the drain, you can take it apart for a while and fix it back after the cleaning is done. To optimize your cleaning, you can use some additional mold-killing agents such as vinegar, bleach, and fungicide that can help you get rid of black mold in the bathroom drain. Preventive ways are always needed before it is too late. You can prevent black mold from growing in your bathroom by applying anti-mold paint on the clean bathroom wall and ceiling. In addition to retaining the bathroom moisture and keeping bathroom humidity in low level, anti-mold paint is a good way. 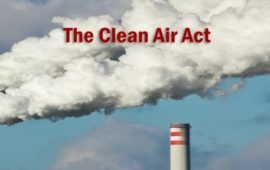 It will hold the steam produced by showers as a primary cause of black mold infestation.